OS X Yosemite 10.10 Developer Preview 7 (DP7) (Build: 14A343f), OS X Server 4.0 Developer Preview 5 (DP5) (Build: 14S274j), Xcode 6 Beta 7 (Build: 6A280n), Apple Configurator 1.7 Beta 5 and OS X Yosemite Recovery 2.0 Updates are officially available from Apple to all Mac OS X developers and non-developers (general users) for upgradations / updations. Mac device users can Download OS X 10.10 Yosemite DP7 (14A343f) Delta / Combo, OS X Server 4.0 DP5 (14S274j), Xcode 6 Beta 7 (6A280n) and Apple Configurator 1.7 Beta 5 Update / Setup Installer .DMG Files via Direct Links. The official changelog OS X 10.10 Yosemite Developer Preview 7 (DP 7) (Build: 14A343f) Update pre-release version contains; bug fixes, system software performance improvements, enhancement and stability issues fixation with the addition of new features and functionalities. Whereas pre-release version of Xcode 6 Beta 7 (Build: 6A280n) Update changelog holds; new Swift hardware I/O tools, Swift command line tools, Graphic tools, Xcode IDE and iOS Simulator with other frameworks tools required for OS X Yosemite 10.10 Apps and iOS 8 Apps development via Mac OS X 10.10 SDK and iOS 8 Beta 5 SDK. 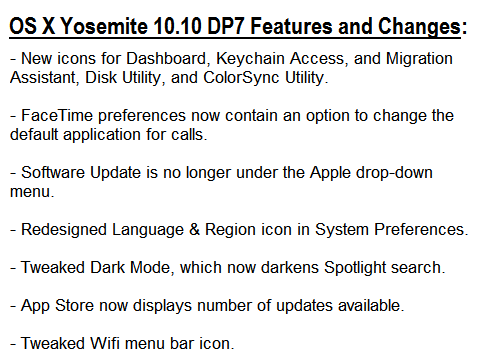 What's New in OS X 10.10 Yosemite Developer Preview 7 Features and Changes? How to Download and Install OS X Yosemite 10.10 DP7 and OS X Server 4.0 DP5 Manually? All Mac desktop and laptop device users can update/upgrade current software version to the latest available OS X Yosemite DP7 (14A343f) automatically via Mac App Store >> Software Update tab. All registered Mac OS X developers can visit OS X Dev Center website for official OS X Yosemite DP7 Downloads, and all Mac general public users (non-developers) and OS X Public Beta Seed Program subscribers can visit Apple OS X Beta Seed Program website to download, install and activate OS X Yosemite DP7 via iTunes manually without Apple UDID registration and without OS X Developer Account requirements for FREE. 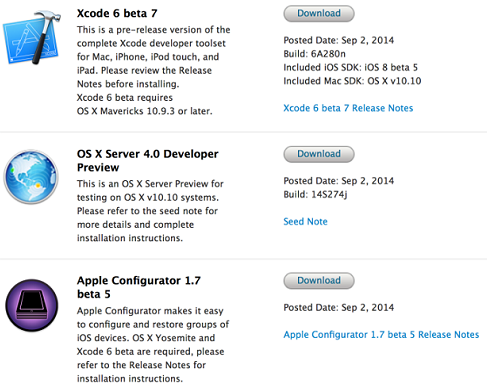 The Direct Download Links of OS X Server 4.0 Developer Preview 5 (14S274j), Xcode 6 Beta 7 (6A280n), Apple Configurator 1.7 Beta 5 and OS X Yosemite 10.10 Developer Preview 7 (14A343f) Delta / Combo Update and Standalone Setup Installer .DMG File for manual installation via Bootable USB or Bootable DVD is also available below.